A few weeks back I was excited to receive a review copy of Jon Coutts's A Shared Mercy from IVP Academic. The book seeks to illuminate the topic of forgiveness via the theology of Karl Barth. Writing on Karl Barth is something of a hobby for me. Naturally, the book has been a pleasure to read. As I near the finish line I feel it was time to provide some interaction and insights from the book. As I venture into this process, I must start with the foundation. 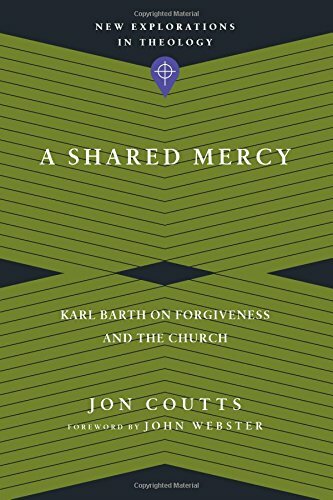 Reading Jon Coutts's A Shared Mercy allows one to delve thoroughly into the process of forgiveness unhindered by limited atonement. Barth's theology certainly presents a Reformed approach to "unlimited atonement." But it is important to qualify — to summarize Barth's theology as "unlimited atonement" would be a gross oversimplification. As with all things, Barth's understanding of the satisfaction performed on the cross is rooted in Christology. Who Jesus Christ is defines for Barth what Jesus Christ does on the cross. Though this might scare off some Reformed readers, it is encouraging to see the topic discussed openly up front. Barth's Christology is the basis for his evaluation of forgiveness. God's effort to reconcile with humanity through Jesus Christ becomes a tremendous encouragement to work through reconciliation with one another. Though I won't be returning to this point in every post on A Shared Mercy, it is worthwhile to keep Barth's unhindered perspective on this issue. It truly is the basis of the book's title shared mercy.